Jennifer Frances is live on WIVB with the Wing Tip of the Day. “It’s never to early to start reading to your kids,” Jennifer says. Bess the Book Bus received a warm welcome on its return to Buffalo. WIVB invited Bess on the air during its live TV broadcast of Winging It! Buffalo Style. Reporter Joe Arena joins Jennifer and Bess in the parking lot to share stories from the 2012 Transitions/VSP Success is in Sight Tour. “When the community steps in,” Jennifer told Joe during the interview “we can make so much more possible.” Strong community support made the events in Buffalo a huge success. Bess visited the Belle Center, Falk School and West Buffalo Charter School. The events were organized by Larry Bicz of Double Eagle Development. The schools were scheduled with from help from Stacey Lund of WIVB. The hotel lodging was donated by Carl Paladino of Country Inn and Suites and Kevin Verall of Ellicott Development. Warehouse space for book shipments was donated by Bob Fudella of CityMade. The outreach that provided more than 200 children with brand new books was the result of community collaboration. Pre-K children at the Belle Center sit for a read aloud. Buffalo didn’t have a drop of rain all summer until Bess the Book Bus came to town. But students at the Falk School didn’t mind. Escorted by umbrellas, they came out two at a time to pick out a brand new book. You can check out Jennifer and Bess on Winging It! Buffalo Style in the videos posted below. More photos and stories from Buffalo are available on our Facebook page. Until next time, safe travel through the pages. A national mobile book distribution program made one of several stops to deliver books to more than 200 children attending the Educare Central Maine early learning program on Thursday. 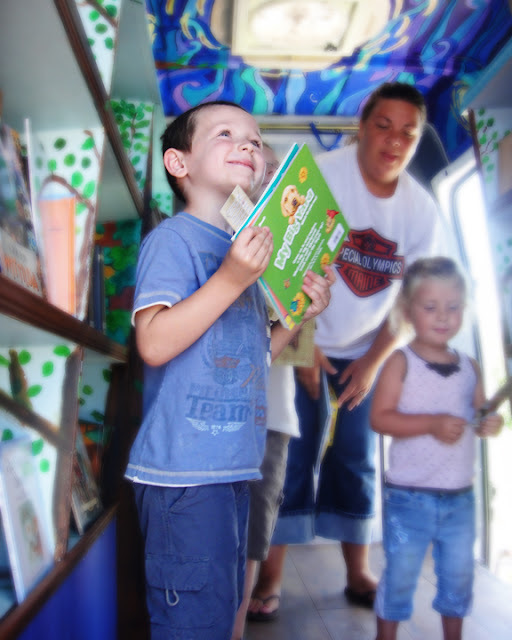 Bess the Book Bus is a mobile literacy outreach dedicated to getting books into homes of underprivileged and under-represented children and families. The bus, packed with books travels to schools, community centers, shelters and after-school programs conducting read-alouds and hands out new books. The program’s goal is to build home libraries for children while generating enthusiasm for reading. The 2012 Transitions VSP Success is in Sight tour will allow new books to reach more than 20,000 families in 44 states and will give away more than 100,000 books. 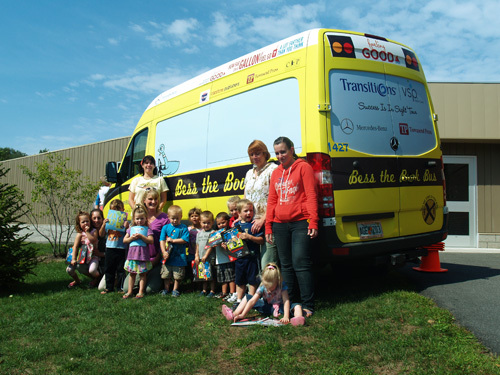 Locally, Ellen Richmond, of the Children’s Bookseller, in Waterville, supports Bess the Book Bus’s distribution in Waterville and maintains an important connection to mobile bus organizers. The Bus is driven by Jennifer Frances and her crew, which are based in Tampa, Fla. Frances, 40, of Tampa, cashed in her 401(k) plan money to establish the bus 10 years ago. The bus has done national tours since 2005. Video games and television haven’t completely taken over the minds of America’s children. The driver of Bess the Book Bus can attest to that. “It’s always so fascinating to me to see them get as excited as they are over books,” says Jennifer Frances. The 41-year-old has become the Johnny Appleseed of books, passing them out for free and planting a love of reading in the minds of underprivileged kids across the country. They’ll stop at schools, YMCAs, Boys & Girls Clubs and family service centers in low-income areas. At many places, a mobile eye clinic from two of Frances’ sponsors, Transitions Lenses and Vision Service Provider insurance, will give free eye exams and, if necessary, eyeglasses. Crowd sizes vary greatly. At some events, 30 or 40 kids may step aboard. At others, the book bus is swamped by thousands — 8,000 kids in two days in New York City’s Harlem last year, for example. Between 200 and 300 youngsters turned out for a book giveaway at the Bob Gilbertson Central City Family YMCA in Tampa the day before the book bus left for the national tour. The little ones were the most excited, reports Desmond Garcia, the Y’s membership director. They were lining up to get their free books. “A lot of the kids, they don’t have the opportunity to have a book of their own,” he says. Parents were asking when the book bus would be back. The charity has nearly gone broke a few times, Frances says, and each time a sponsor has come through. She seeks donations of books and gift cards for food and motel stays from the public, but she has been able to keep rolling mainly through the help of past and current sponsors, among them SuperMedia, Citgo, Mercedes-Benz, Townsend Press and Capstone Press. Others include Inkwood Books, Publix, Target and Levi’s. “Over the years, I’ve become motivated a lot — and I’d like to say this more nicely than it is — but by anger,”she says. “It’s hard to imagine this is all the same country,” he says. Frances likes watching the kids’ reactions on the bus, listening to them talk to one another about books and characters. Kids still love to watch TV and play video games — that’s just their nature, Frances notes. It is an incredible thing to be living my dream. These last 10 years have been full of “pinch me” moments and the fear that I would wake to find I had simply been dreaming. There were even a few times I felt more like a character in a movie than a woman living her dream. And yet, it is true. This is my life. Bess the Book Bus is real. I am amazed and humbled to find myself here. I did not nor could not have done this myself. Sure, it took a leap of faith to start Bess, but the faith I had wasn’t only in myself. It was the faith that my friends and family would support me, that my community would back me, and that enough people would believe in my dream of making books accessible to all children to make it come true. And they did. Bess has been through some tough times. Many of which left us days from having to close the doors. We have been out of books, out of money, and even out of a vehicle. In fact, that is how we ended up in this wonderful partnership with Transitions Optical and VSP Vision Care. When they heard of our plight of being out of all three in 2009, they stepped up to help. 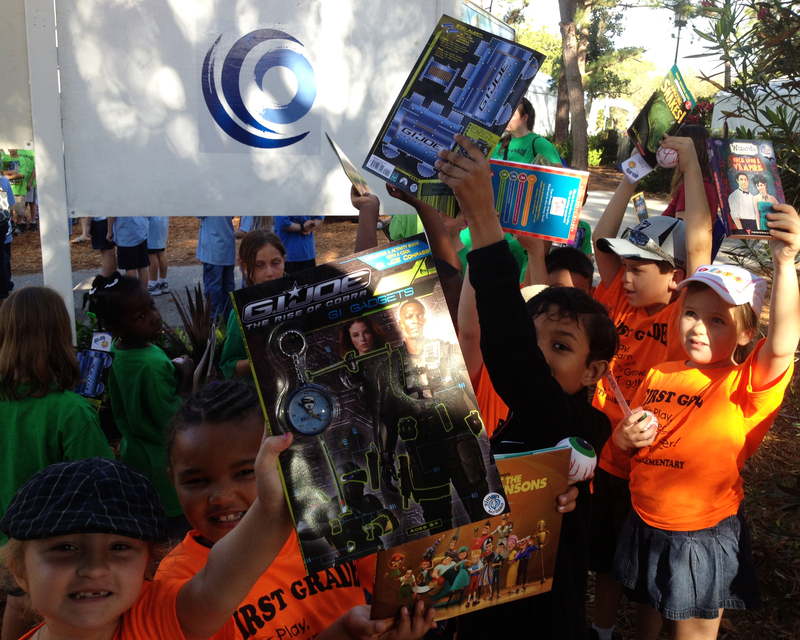 They surprised us on the CBS Early Show and sponsored one of our favorite schools in Tampa, Westshore Elementary. Every student received the gift of healthy sight through vision screenings, comprehensive eye exams, and new glasses with Transitions Lenses when needed. It was a wonder. More than 25 percent of our students received brand new glasses that week. And that was just the beginning of an unbelievable relationship that has changed the path of the bus and put success in sight for our kids. Almost four years, thousands of pairs of new glasses, and 400,000 books later, we are crossing the country together for our fourth Success is in Sight Tour. The Transitions/VSP partnership has made it possible for tens of thousands of our kids to experience the joy of reading through book ownership. Even better, these same kids have been given the gift of healthy sight. Bess travels alongside Eyenstein, the Mobile Vision Clinic which gives our kids in need free eye exams and glasses on the spot. Amazing, right? Each trip has allowed us to grow stronger. We have met amazing kids, parents, teachers, volunteers, community partners like Citgo, Townsend Press, First Book and Capstone Publishers and even favorite authors, all who have helped us go that next mile. Now the Transitions/VSP team is partnering with bloggers and authors to do the Eyecare About Reading national book drive, making it easy for anyone, anywhere to help give free books and healthy sight to kids. Here is how you can help: visit www.Facebook.com/VSPVisionCare, select the Book Drive Tab and make a “promise” to protect your eyes. 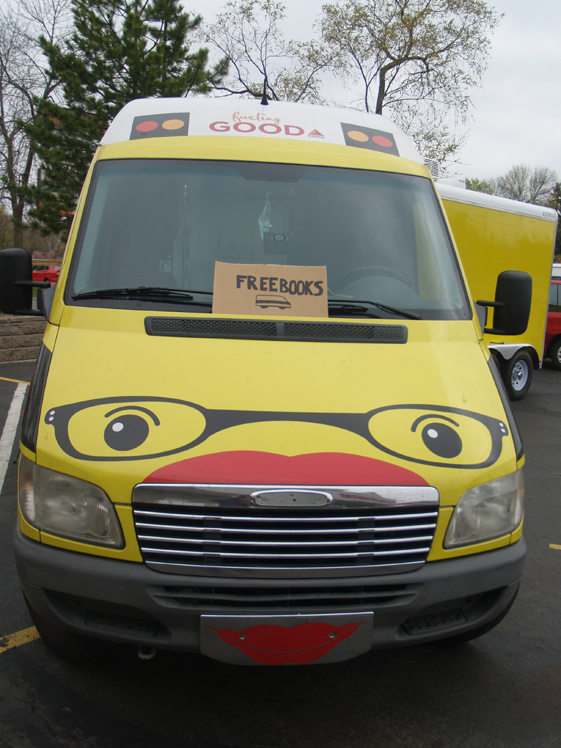 For every promise received, Transitions Optical will donate one free book to Bess the Book Bus. In fact, five of our author friends are donating signed copies of their books as prizes. John Perry author of The Book that Eats People, Margaret Mason author of These Hands, Deborah Diesen who wrote the lovely Pout-Pout Fish and the Barefooted, Bad-Tempered Baby Brigade, the talented Rebecca Emberley author of Chicken Little and many more, and the incredible Cynthia Lord who wrote Rules, Touch Blue, and Hotrod Hamster have all stepped up to support the book drive and Bess’ kids. We would love to have you join us. We hope you will take the Eyecare Promise, spread the word, and see to it that even more of Bess’ kids get to experience the joy of reading and the gift of healthy sight. Good news travels fast. It’s true. All it takes is one person telling another, and the ripple of good begins. Imagine walking out on a Saturday morning and seeing a big yellow bus with a sign that says free books. That’s what Joey, Roman and Mackenna saw while walking with their father to the Georgetown Village Market. They were the first ones who found Bess the Book Bus when the 2012 Transitions/VSP Success is in Sight tour rolled into Racine, WI. Their excitement set off the chain events that sent books into classrooms, health clinics and home libraries. Joey, Mackenna and Roman pose with their brand new books at the Georgetown Community Market in Racine, WI. After the three had first pick of the books aboard the bus, they went back to the neighboring apartments and started fueling good. They spread the word so fast, that it seemed like no time until we had a steady trickle of pajama clad families coming to see about the bus giving away free books. Amazed, parents pulled out their cellphones and passed along the good word. “You won’t believe what is going on at the CITGO station,” they said and the crowd grew bigger. Word spread from Racine to Milwaukee. Mary Siegrist is the director Reach Out and Read Milwaukee. The organization gives away more than 10,000 books each year to health clinics and hospitals for doctors to give to children. It promotes health and literacy in communities that struggle with each. 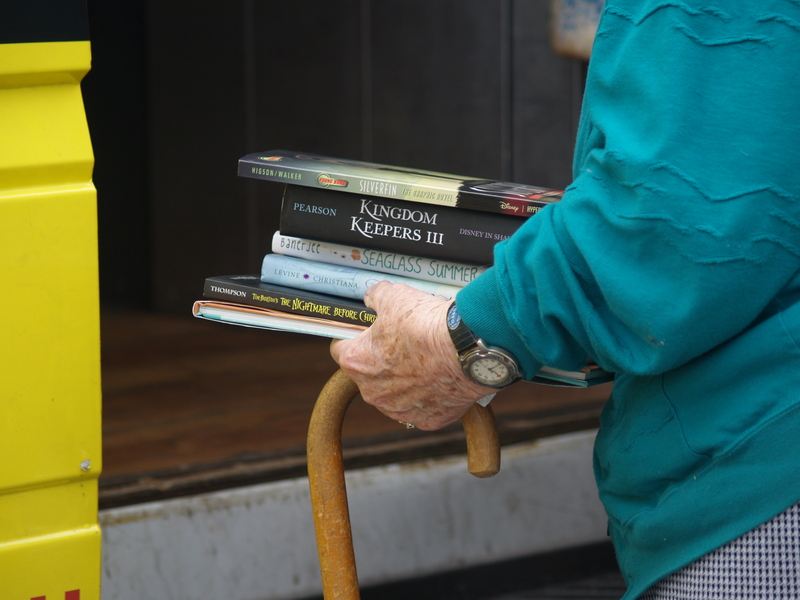 We met Mary last year at an event in Milwaukee, where we loaded up her car with 1,200 books donated from Capstone. This year, we helped again, donating 900 new books to the cause. Paying forward a good deed goes a lot further than you think. 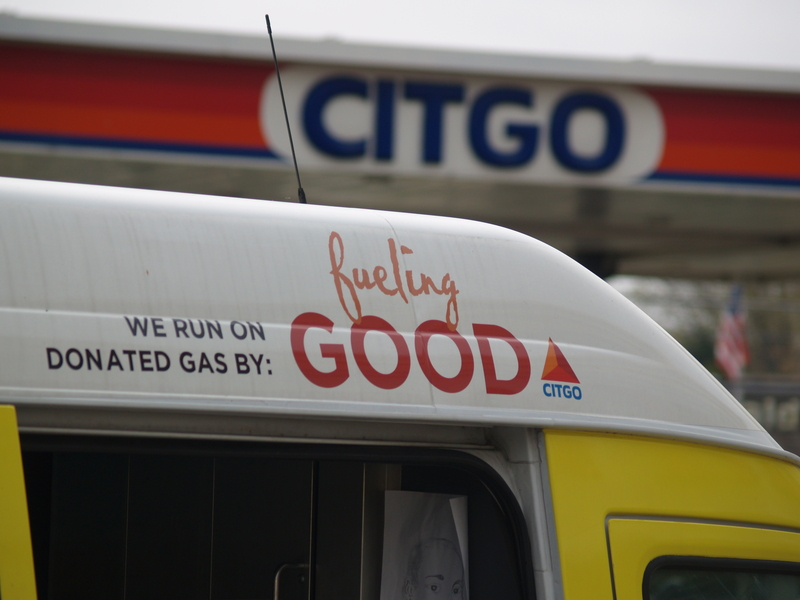 It only takes one person to start the ripple that creates the Fueling Good phenomenon. In Racine, kids went door to door, parents called friends and Mary Siegrist drove from Milwaukee. They all knew a good thing when they saw it, and that’s something worth sharing. Together, we can keep the good rolling all across the country. In 2008, there were more murders in Chicago than U.S. soldier casualties in Afghanistan. Englewood is one of five Chicago neighborhoods that has seen more than 100 murders since 2007. Last year, Jennifer received a request for a visit from a school located inside the three mile area. Miss Vikki Stokes, principal of Guggenheim Elementary school wrote to Bess the Book Bus explaining the challenges seen in her community. She made an honest ask on behalf of her kids, when others in similar situations would be hesitant. We visited last July while most students were in summer school. For some, the classes were voluntary and students could stop by for a free lunch and breakfast. It was a safe place to be. The 2012 Transitions/VSP Success is in Sight Tour returned to Chicago for four days of outreach split between the inner city and the suburbs. 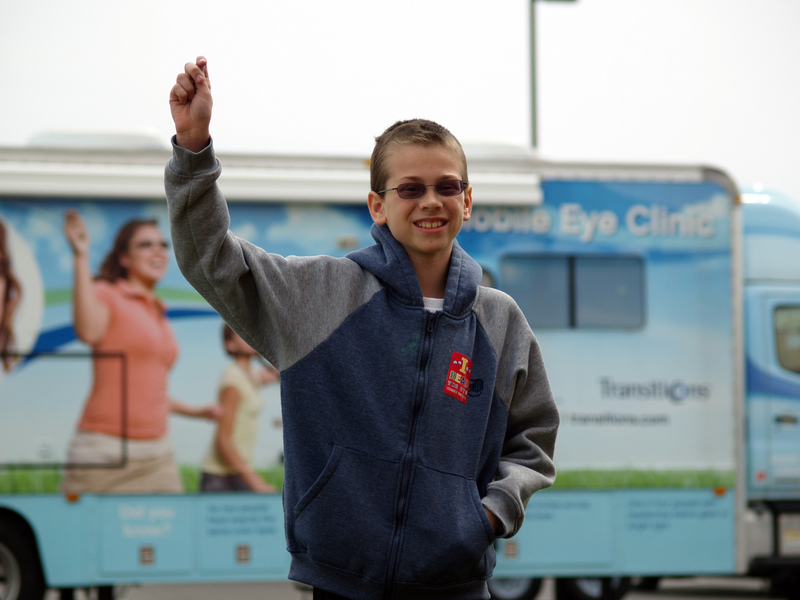 We partnered with Transitions, VSP and Hoya Vision to bring Eyenstein, the mobile eye care clinic, to provide free comprehensive eye exams and glasses to the students. For the city schools, we chose Guggenheim and Morgan elementary schools. Miss Stokes transferred this year from the former to the latter. Morgan Elementary is located 12 blocks south of Guggenheim, a distance of about two miles, but the two schools seem worlds apart. Students at Morgan Elementary School are excited to read. At Morgan Elementary, the students knew what books they liked, and talked about the things they wish they could read. We were asked for Cam Jansen mysteries, Big Nate and anything involving dinosaurs. Sabria Jackson was amazed by the bus. She spent twenty minutes picking through the shelves, pulling out books, carefully reading the back covers and leafing through the pages. Sabria knew she could only choose one book to take home, and she was going to make sure it was a good one. 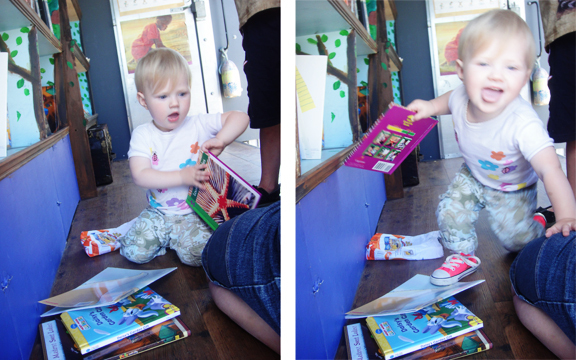 Seeing that is a sure sign that she has developed a love of reading. The teaching staff at Morgan Elementary are responsible for that. They incorporate books into the class every day. Yolanda Sattler is a resource specialist working with seventh and eighth grade students, and she still reads aloud to her class. The Bluford series from Townsend Press is the only thing her students are excited to see. “I think the students can relate to the situations in the story lines,” she says. The books cover the issues faced by students including bullying, body image and school violence. She picked out a classroom set, including the newest books Breaking Point, Pretty Ugly and The Test. There was a constant crowd outside the bus all day. Even after the final bell rang, students asked to come back aboard and pick out an extra book for their little brothers and sisters. At Guggenheim, we saw an entirely different school. Third and forth graders cleared our selection of activity books and seventh graders walked away with Mickey’s Scary Night. The kids’ book choices reflected the fact that they did not seem to know what they wanted and that they seemed unwilling or uninterested in challenging themselves. A retired teacher that was passing by came aboard to check us out. She commented that the books were just too hard for these kids. Even at 5th grade she insisted they needed sight words. They had not learned to read for the most part. Their parents were not readers. There were no books in the homes and few in the school library. Comparing the two schools, you have to ask which student stands a better chance. Chicago can be a tough place to grow up. The pressure to do well doesn’t meet the present opportunities. We have to ask ourselves if we are doing the best we can for our children – ALL of our children. We have to stop being so short sighted. It is time we put politics aside and assess our vision for their future and realize that ours depends on it. If we do not afford these children the same basic resources as we afford our most privileged children, how do we expect them to succeed? How do we expect this country to succeed? David poses with his brand new glasses, which were made aboard Eyenstein, the mobile eye care clinic from Transitions and VSP. David was one of 94 fifth grade students at Central Elementary School in Plainfield, IL who received a comprehensive eye exam. The screenings were part of the 2012 Transitions/VSP Success is in Sight Tour as Bess the Book Bus and Eyenstein, the mobile eye care clinic from Transitions and VSP, visited four Chicago Area schools. To start the sixth grade, Chicago students are required to have a dental and health screening before the first day of school. But the rules include nothing about a vision test. More than 80 percent of what students learn is taken in visually. An undetected vision problem can cause the student challenges in the classroom. Hoya Vision partnered with Transitions and VSP to provide volunteers and trained staff to accommodate the screenings at Guggenheim Elementary, Morgan Elementary, Richmond Intermediate and Central Elementary. 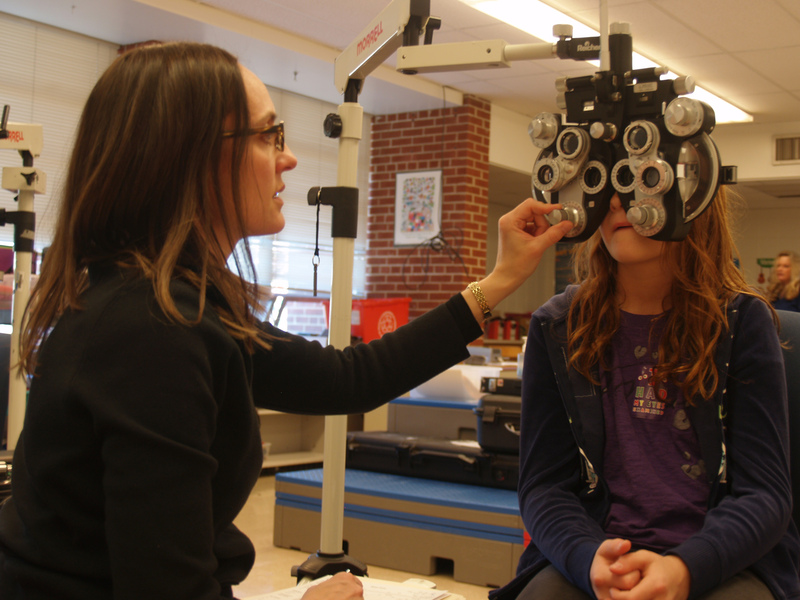 Dr. Cheryl Meyers adjusts the phoropter on a student during a comprehensive eye exam at Richmond Intermediate School. Music rooms were transformed into exam rooms to accommodate the large number of screenings. Additional autorefractors and phoropters were brought in, and three optometrists were on hand for the screenings at each site. Ryan Schilb, a teacher at Richmond Intermediate, knew that some of his students needed glasses. He could tell by the way they squinted at the blackboard and complained of headaches in class. A new seating chart wasn’t solving the problem, but help came from a visit from mobile clinic could. Seven of his students received a comprehensive eye exam and four came back with glasses. 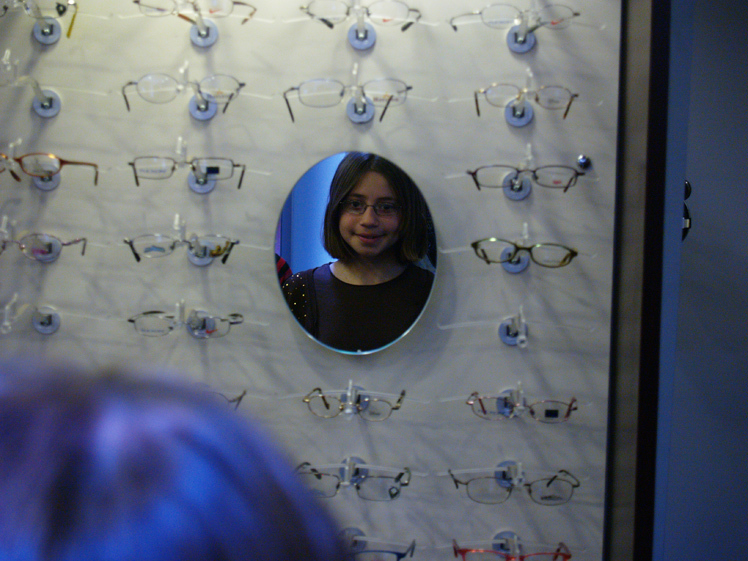 A student tries on frames after her eye exam. Eyenstein is a complete mobile clinic with an exam room, lens grinder and dozens of frames to choose from. Throughout the four schools, 298 students had a comprehensive eye exam and nearly half needed glasses. Ninety one students walked off of Eyenstien with glasses fitted with Transitions lenses and another 41 had prescriptions sent to Hoya Lab to be filled. 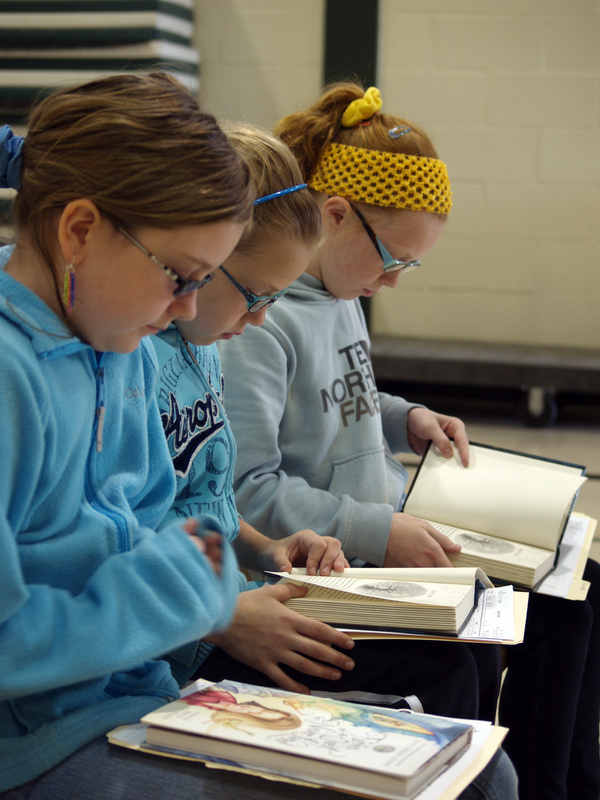 Students read books while waiting to see an optometrist. Vision and literacy go hand in hand. 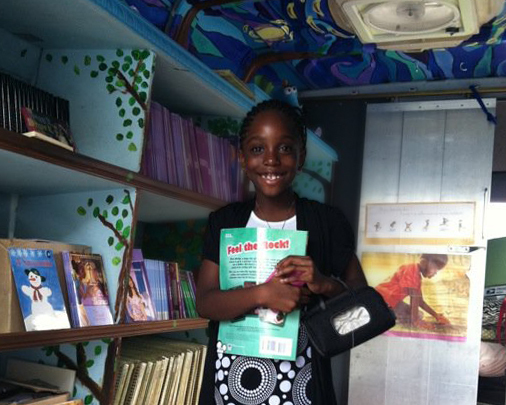 Before student students saw an optometrist, they came aboard Bess the Book Bus and picked out a brand new book. Over the course of the week, 1,953 books were given to students to build home and school libraries. Safety Harbor Elementary students show off their brand new books from Bess the Book Bus at the Transitions Golf Championship. A good golfer is happy with a drive that goes beteween 300 and 400 yards. But from behind the 18th hole at Innisbrook, Bess the Book Bus is hoping to make it all the way across the country. Since 2009, the Transitions Golf Championship has served as the kick off event for Bess’s nationwide mobile literacy outreach. The 2012 Transitions/VSP Success is in Sight Tour starts the same way. It is a busy day as 900 students arrive from six schools for Youth Days at the Transitions Championship. They traveled from as far as Polk County. Rushes come in waves as students roam the course and experience the various events including activites with Radio Disney and golf talk with the pros. Walid, a second grader from Lynch Elementary, goes wide eyed as he steps on board Bess the Book Bus. “There are so many books to choose,” he says while sifting through the shelves. 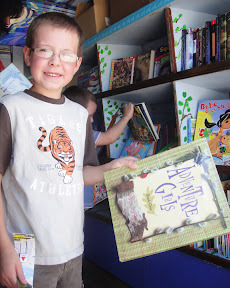 He passes through Magic Tree House titles and an illustrated copy of The Hobbit. Then he looks at Rick Riordin’s The Last Olympian and Lois Lowry’s Number the Stars. Finally, he settles on a G.I. Joe coloring and activity book and hops out the back of the bus. Another student steps on to pick a brand new book to take home. Free comprehensive eye exams took place inside the Think About Your Eyes pavilion, where more than 500 students were screened. One in four children suffer from undetected vision challenges. These challenges can lead to difficulty learning in the classroom and cause a cascading effect on a child’s development. Transitions and VSP provided Sight for Students gift certificates so that students could receive comprehensive eye exams and glasses with Transitions Lenses. In 2011, Transitions and VSP donated more than 5,000 gift certificates to students across the country. Students were invited to Youth Days at the Transitions Golf Championship for completing the My Eye Promise and a response to a simple question. Students were asked what they would miss without healthy vision. Their answers ranged from sunrises to sunsets, and the faces of their friends and families. But as students exited the book bus with their heads down, nearly tripping on their own two feet, it was obvious they would miss the joys of a good book. Youth Days continues on March 14. The 2012 Transitions VSP Success is in Sight Tour starts in April with stops in Chicago, Atlanta and Detroit. 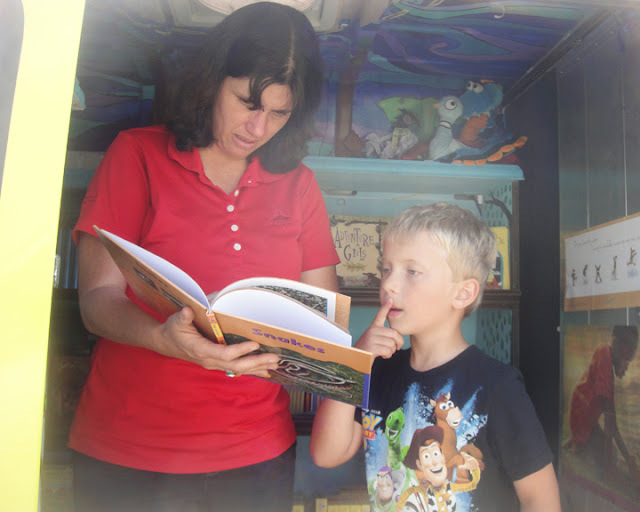 To bring Bess the Book Bus to your school or community program, e-mail a request to Jennifer Frances at jenn@bessthebookbus.org. Follow Bess on Facebook, Twitter and YouTube for updates on the tour. And as always, safe travels through the pages. The 2011 Transitions/VSP Success is in Sight tour encountered a set back when Bess the Book Bus broke down en route to Millinocket. Getting a tow turned into an ordeal, but the worst part of the day was missing our event. 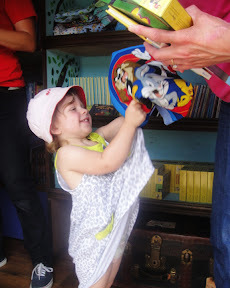 Aid for Kids brought a care package on our behalf filled with brand new books and hand sewn blankets. The books went out on time with Bangor Savings as part of an exciting day with a bounce house and lunch to lift the spirits of a downtrodden town. Millinocket has faced a series of hardships over the past three years including the closing of its two paper mills. The most recent closing happened in April, leaving hundreds unemployed. Tax revenue is down and causing cutbacks in the town’s services. The library hours were cut in half. Opal Myrick Elementary School will move from its building and start the school year inside the high school. With Bess still in the shop, the 2011 Transitions/VSP Success is in Sight tour continued book fair style in Fort Fairfield. We brought boxes of brand new books into the library and spread out on the tables. Children browsed around looking through the titles. We had a great selection including books from Candlewick Press, Capstone Publishing, Penguin and Townsend Press. After everyone found the perfect book, it was story time in the children’s room. Oliver Caron looks in awe as Jennifer Frances shares fun facts from "Snakes" by Capstone Publishing. Fort Kent features the northernmost point of U.S. 1, the 2,300 mile road that travels through 13 states along the Atlantic coast before ending in Key West. But unlike the Southern tip, Fort Kent is not known for year round visitors. The 2011 Transitions/VSP Success is in Sight Tour traveled north at the request of Michelle Raymond, Fort Kent’s head librarian. 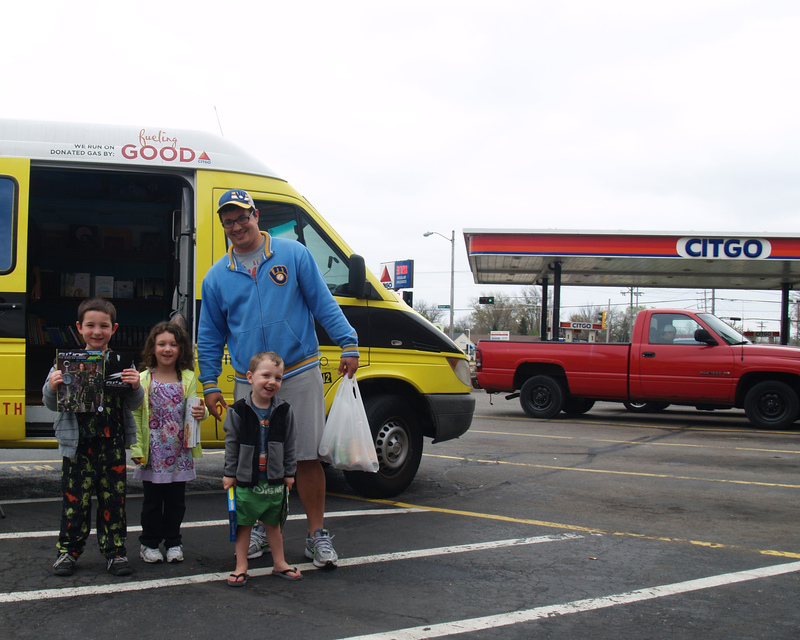 More than 30 children were also excited that Bess the Book Bus made the drive, including six-year-old Oliver Caron. Snakes are one of his favorite things and found the perfect book on Bess’s shelves.